Loomis Bros. Equipment Co. carries NATCO and Hamilton water heaters for coin operated laundry facilities. These are two of the most respected brand names in the industry with the reputation of engineering innovative water heaters. 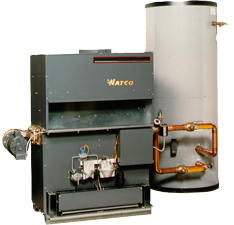 NATCO and Hamilton water heaters are energy efficient without sacrificing performance. Our parts department and Resident Field Service Technicians are located strategically throughout our territory which allows us to respond quickly to your needs. For over 30 years, Hamilton Engineering has been supplying the industry with innovative hot water systems. The NATCO Fire Coil 85 is engineered for simplicity and reliability and can use both inside and outside combustion air.